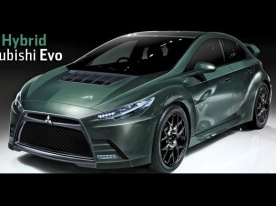 Autocar reports this morning that the next Mitsubishi Evo will be powered by a hybrid powertrain and will go on sale within three years — this, according to an interview with company president Osamu Masuko has confirmed to Autocar. Although Masuko did not reveal the full technical details, it is understood that the Evo XI will switch to a diesel-electric hybrid powertrain, saving it from tightening emissions regulations while preserving its trademark mid-range shove. "We will start work on the project next year, and it will be ready within three," said Masuko. "I have set the goal of developing a sporting car featuring electric power." I have... no words.